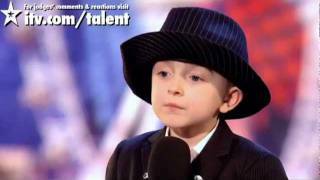 7-year-old Robbie is here primarily to sing, but also to give his mum the best birthday present ever. This fearless young lad wants to make his family very proud of him - especially his aunty, who he immediately tries to set up on a date with judge Louis! Little Robbie got 3 "yes" for his fantastic performance. Congratulations to our little boy! But let's see if his impressive talent is good enough to come to the finals of the competition.